Publishing online today in PNAS, the research group of Prof. WU Xiaolei at the State Key Laboratory of Nonlinear Mechanics, Institute of Mechanics, Chinese Academy of Sciences, in collaboration with Prof. En Ma at the Department of Materials Science and Engineering, Johns Hopkins University, USA, have demonstrated a strategy for exploiting a dynamically reinforced multilevel heterogeneous grain structure (HGS). Fig. 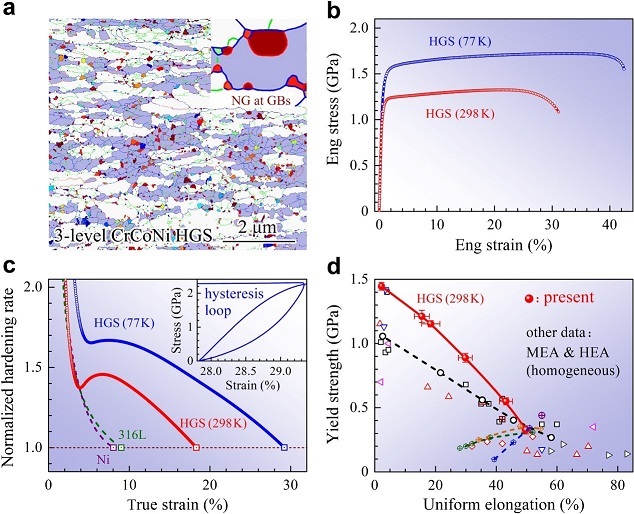 A. Multilevel heterogeneous structure of single-phase CrCoNi medium entropy alloy after tensile test: Micrometer-sized grains (white), submicron grains (blue), nanograins (colored). Nanograin forms at grain boundaries of submicron grains. B. Tensile properties. C. Normalized work hardening rate. D. Combination of yield strength and uniform elongation.